I've heard reports this week of some nice bonefish being caught..... some of the larger ones topping 9 pounds. They are not all that big, but then even a small one will get you into the backing. As the water temperature heats up this summer we should see more and larger bones. the rain came down and the water level came up 6 feet.... Now those spawning fish are deep and there is no way to see their nests. On the positive side, there has been good action along the shore as the peacock bass are chasing shad and little chiliads. Visiting from San Diego, eight year old Nick took full advantage of an early birthday present (a fishing trip) to add Hawaii peacock bass to his large and growing list of caught fish. I must say it was a real pleasure to have someone on the boat that could cast as he does. He was also tying on his own hooks. Watch out for this kid.... his goal is to host his own fishing show. Nick and one of his many peacock bass. Report Description: With the state trying to lower the water level of the lake from 80 feet (full) down to 65 feet (flood control incase of a hurricane) the lake level has been like a yoyo. With a little rain in the mountains, the lake level can rise 3 or 4 feet in a matter of as many hours. With the water level way low, the small fish don't have any grass to hide in and the peacock bass cruise the shoreline. Find some very shallow water filled with little fish and the big guys are always near by. The water level rose 10 feet this week and the baitfish are all way back up in the grass. The good news is... everything is chasing shad in the middle of the lake. Peacock, largemouth, and smallmouth bass. Since there is nothing to tangle the lines, we fish ultra-light spinning tackle with 4# test line. Good fun catching 2 to 5 pound fish. 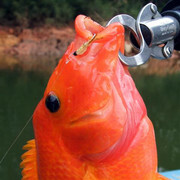 Sometimes the red devils are caught under the schooling peacock bass. Report Description: Haley needs to work on the casting part a little more, but once those schooling peacock bass hit the fly they don't stand a chance. Report Description: I have ESP... I can see into the future and predict things that are going to happen. For some reason I turned around and saw that she had laid the rod on the deck beside the seat. Lo and be hold, as I stepped toward the stern of the boat to secure the rod, it seemed to grow legs and scramble accross the deck, leaped out over the water, and with a splash, dived into the depths of the lake. Just the way I had seen it in my thoughts only moments before it happened. You know, I even amaze myself some times. and the peacock bass were spawning. Near Mikimiki Flats, the small shad were leaping from the water to escape the schooling peacock bass. Red Devils lined the shallows. Decisions, decisions. A schooling size peacock bass. It wasn't the wild and sustained bust like we'll see later in the year, but enough action from 1 to 2 pounders to keep us interested. When the schooling action slowed, we drifted closer to shore picking up a few big red devils. Every so often a peacock bass would dart in from the depths to grab the small red devil flys. We were seeing lots of fish. Big Male Red Devil. They average from 3/4 to 1 pound in weight. Larger spawning fish were our target so we moved along, scanning the shallow water. (A good pair of polarized sunglasses is a must if you want to see the fish.... if you can't see e'm, you can't catch e'm.) It didn't take long. Those big boys don't like anything swimming near their nest. A minnow looking artificial fly anywhere near a spawning pair of peacock bass draws some vicious strikes. The big bump on it's head identifies this 4 pounder as a male. Unlike largemouth, the male fish is always larger than the female. Mar 24, 2009; 03:54AM - peach Oscar? I just knew that I had caught my first 'Peach Devil'. But John was quick to point to the tail and inform me I had captured an Oscar. Have any of you guys ever seen an Oscar this color before? This is what we were after....Red Devils. Look at the hump on his head. They get aggressive during spawning season. Those tropical fish go into hibernation till the water temperature climbs back up over 75. Enjoying a few days of sunshine, we took our 3 and 4 wt fly rods in search of red devils. The Red Devils were every where. You just cruise the shoreline and spot them in the shallow water right next to the bank. It's easy to see a 3/4 to 1 pound bright red fish. The male fish has a huge hump on it's head and guards it's territory aggressively. I don't know if the small flashy streamers and nymph flys make it angry or hungry... I'm just glad they bite them. An added bonus is the bluegill. They like small flys and are also fun on a light flyrod. Then there are the peacock bass that appear out of nowhere and smash your fly. You get a 2 pound peacock on a 3wt flyrod and you have your hands full. All this practice on the 'small' fish will have us ready for the 3 to 5 pound peacock bass that will get really aggressive when the water temperature hits 80 degrees. Now that's exciting. Report Description: The lake is clearing up nicely since the big floods in December. Now that the water temperature is 74 degrees, the peacock bass are starting to school up and chase the shad again. Most of the fish are 1 1/2 to 2 pound size. There are lots of them and when you scale down your tackle to a 4wt or 5wt fly rod.... it's a good fight. And really exciting when one of the 3 pounders hits. The threadfin shad they are feeding on are very small, just an inch or so. We scaled down our flys to take advantage of the feeding frenzy. 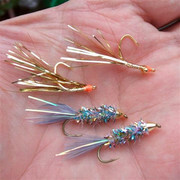 The gold fly is just a #10 AH hook with gold Flashabou... a simple streamer. The purple looking one is a cone head wooly bugger without the hackle. Keep it simple, make it fun. This last few weeks I've seen some very successful anglers. One reason was that if one technique wasn't working, they were quick to try something else. That something else was fishing deep. Down where the big ones lurk. Normally when fly fishing I use a floating line. Recently I discovered the benefits of using a sinking tip or full sinking line. One angler tried a deep diving crank bait. Working the schooling peacock bass chasing shad in the middle of the lake, he could get the lure down deep and was rewarded with some nice size fish. We were catching more fish with the fly rods, but they were a lot smaller. While fishing Morgans Point with live bait, another angler discovered that the larger peacock bass seemed to be deep. 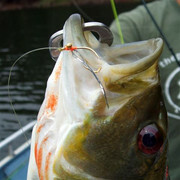 He started using a lead head jig to get his live bait quickly past the smaller fish down to the larger fish. So how do you get your fly down deep? Sinking line and a short leader. Fishing from shore at Morgans Pt., the sinking line would carry the fly swiftly to the bottom, 20 or 30 feet deep. As soon as it hit the bottom we would start stripping the fly in as quick as possable. Those big peacocks hit hard. There are some huge peacock bass in Lake Wilson... and geting down deep might be just the place to find them.